The USB-C Ethernet adapter with power delivery- Black is the perfect solution for wired network connectivity and data transfer on the go, in the office, or any work space while having the ability to simultaneously charge a mobile device, easing the user's worry of their device dying while far from a power source. 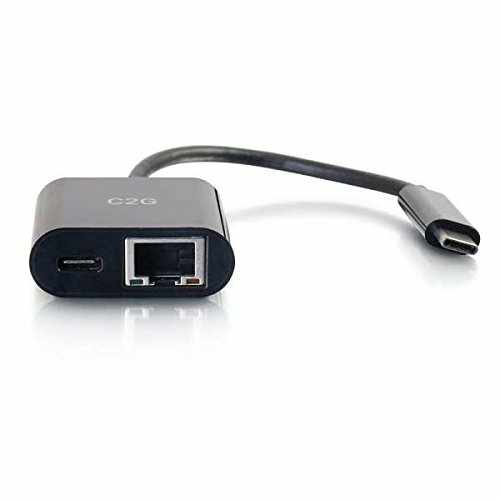 Can connect to a usb-c or Thunderbolt 3 enabled laptop, tablet, or desktop computer and also features an Ethernet port and a USB Type-C port with power delivery, allowing versatility among devices. Portability and convenience increase This product's usability because of its small form factor adapter. Adaptor is absolutely perfect for connecting to networks where Wi-Fi is unavailable for computers that do not provide a wired Ethernet port or have a damaged port. Reliable Ethernet port transfers speeds up to 1000Mbps, while the USB Type-C port provides up to 60W of power to connected devices. No driver required for Plug and play.